Charles Platt was one of the founders of CryoCare. He played an active role developing the organization structure and writing the bylaws, and served as Vice President for three years, during which time he also produced our newsletter, CryoCare Report. 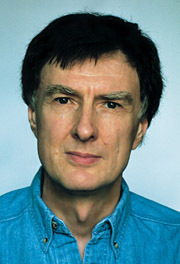 Platt has worked as a computer programmer but is primarily a writer; forty of his books have been published, ranging from science-fiction novels to computer guides. He writes frequently for Wired magazine, often on science topics, and contributed often to Omni magazine before it ceased publication. For Omni he created the "Immortality Contest," which offered a free cryopreservation as its first prize, created unprecedented media interest, and was highly successful. Platt managed public relations for the Alcor Foundation before helping to establish CryoCare. He has also participated in three cryopreservations and has done volunteer work for BioPreservation and 21st Century Medicine. He was born in Britain in 1945, moved to New York in 1970, and currently alternates between an apartment in New York and a second home in Arizona.